Wilko on Christmas University Challenge! 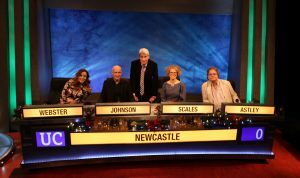 Yes, Wilko will be joining his fellow Newcastle University alumni for Christmas University Challenge! Wilko’s alma mater will be thrashing it out against City University on December 21st, 7.30pm on BBC 2. To see full details click here. Don’t miss it! It’s going to be FUN.